Home / Posts Tagged "George Clarke"
History Hub Ulster associate member Peter McCabe is a local historian who enjoys visiting local graveyards and discovering long lost stories. In this short article, Peter discusses a different aspect of the Princess Victoria shipping disaster on the 65th anniversary of its sinking. 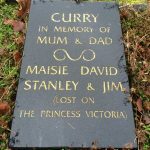 Until recently I only had a passing interest in the sinking of the Princess Victoria, aware of the memorials in both Larne and Stranraer, and of my parents mentioning the disaster on occasions (they were both aged 8 at the time). Reading Stephen Cameron’s excellent ‘Death in the North Channel’ book heightened my interest, as did the passing of the last survivor of the Princess Victoria disaster at the end of last year, pantry boy at the time William McAllister. So, on this, the exact 65th anniversary of the disaster of 31st January 1953 – when 135 passengers and crew perished in the North Channel, with not one woman or child amongst the 44 survivors – rather than revisit what happened to the Princess Victoria and its impact on the local community (imagine the shock if one of the ferries regularly plying the route from Belfast to Cairnryan was to flounder), I thought I would look at any ‘footprint’ left by the disaster all these years later. As well as the sensitive memorial mentioned above in Larne, the main remaining ‘footprint’ is on the headstones of the fatalities – and one survivor – so, rather than starting by looking at the town of Larne first where the majority of the passengers are commemorated, I thought I would start with Belfast City Cemetery finishing with a selection of fatalities buried in Larne, with those photos kindly provided by Ricky Cole and History Hub Ulster member Nigel Henderson acknowledged as appropriate. 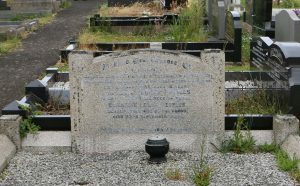 Walter Dorling Smiles – By far the most prominent fatality laid to rest in Belfast City Cemetery is Sir Walter, an MP for the constituency of North Down at the time of his death aged 70. Walter had received 2 Distinguished Service Orders during the Great War and was recommended for a Victoria Cross on one occasion. It is said that, if the weather had been better, Walter would have been able to see his home at Orlock from the ship as she sank off the Copeland Islands. Walter was the first Managing Director of the Belfast Ropeworks at Connswater. In one of the few commemorations of the sinking outside of local cemeteries, on the wall of the former Inglis building on the other side of East Bread Street from the Ropeworks, a plaque has been erected in memory of the Piggot brothers – both employees of Inglis, and both of whom perished in the disaster. 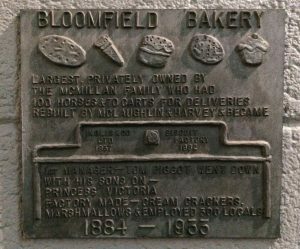 Interestingly, the plaque also claims that their father Tom – the first Manager of the bakery – also died on the Princess Victoria, but this was not the case. Robert Kelly – Robert was a 46-year-old married man and a fitter by trade living at Wallasley Park in Belfast. 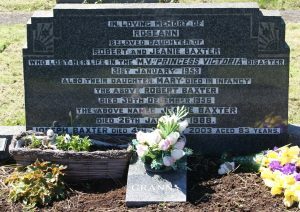 His headstone is difficult to read but, with the help of the online burial records, it is possible to establish that Robert’s wife Margaret is also buried in this plot, dying aged 84 in 1994 41 years after her husband. James Curry – at first glance the Curry headstone seems to indicate that the entire family perished in the disaster but, thankfully, that wasn’t the case, with ‘only’ James dying. Married with 3 children and living at Roden Street in Belfast, James was an employee of Short Brothers and Harland at their Wig Bay factory. Victor Mitchell – Aged just 30 when he perished, like his cousin James Curry mentioned immediately above, Victor was employed by Short Brothers and Harland at the Wig Bay factory, working as an electrician, and living at Espie Way (off the Upper Knockbreda Road) with his wife and young children when back in Belfast. Whilst burial records show that Victor is buried in Grave X-227 in the Glenalina section, sadly, there is no evidence of his grave 65 years after he was interred there. 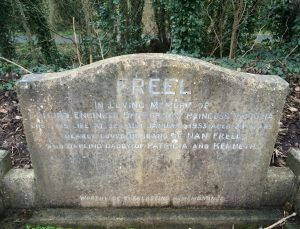 Edmund Freel – Edmund was a Fourth Engineer Officer who lived at 3 Ashbrook Crescent, and was aged 29 and married with a young son and daughter. Edmund had initially worked for Harland & Wolff, before joining the Merchant Navy after World War Two and travelling widely. Edmund had decided to leave British Rail (who owned the ship) to return to work in the Belfast shipyard and, heartbreakingly for his wife and young family, was only working an additional weekend shift to get extra money to buy tools before his return to ‘the Yard’. There was further heartbreak for his family when his body was recovered from a lifeboat that was washed up at Kearney Point, meaning that he had perhaps survived the initial sinking but perished afterwards. 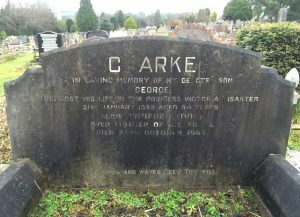 George Clarke – lived in Derby, travelling to visit his mother Winifred who lived at Hillsborough Parade, and was planning to take her over to Derby to live there too. Winifred is buried in the plot too dying 14 years later in 1967 whilst still living at the same address. Interestingly, at the base of George’s headstone, the following words are featured: ‘The Winds and the Waves Obey Thy Will’- not an easy sentiment to express in the months after George’s untimely death I’m sure. Lieutenant Commander Douglas & Ruby Bilney – the Bilneys were travelling to take up a posting at the Royal Naval base at Eglinton. 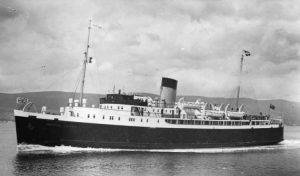 Commander Bilney’s body was washed up at Castletown on the Isle of Man several days later, whilst Ruby’s remains were recovered from the sea and brought to Belfast by SS Ballygowan. 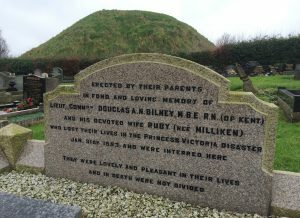 Ruby’s parents lived in Dundonald, so this is why the Bilneys now lie in this scenic graveyard in the shadow of the ancient moat. Frank Jewhurst – even more in the shadow of the moat is the final resting place of Frank Jewhurst. Frank was a captain and adjutant of the 53rd AA Workshop Company REME (Royal Electrical and Mechanical Engineers), living at Cherryhill Drive in the village, and was aged 60 at the time of his death. 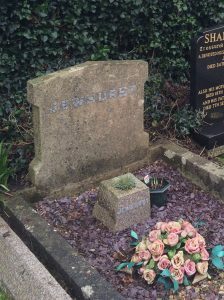 The name Jewhurst is the sole wording on this simple headstone. The only reason I know that this is Frank’s final resting place is because a relation of his happened to mention this to me when I was talking about Sir Walter Smiles during a guided tour of Belfast City Cemetery. 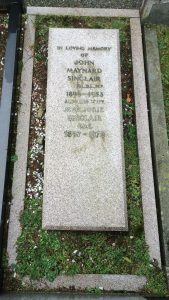 57-year-old Maynard Sinclair was the Deputy Prime Minister and Minister of Finance in the Northern Ireland government. He reputedly helped women and children up to the boat deck, an ultimately fruitless task as, as mentioned in the introduction, all women and children perished as, sadly, did Major Sinclair. On hearing of his loss, his mother-in-law died – presumably of a heart attack – adding further trauma to the family. The Maynard Sinclair pavilion at Stormont is a tangible reminder of the esteem Major Sinclair was held in, whilst a children’s ward at the Ulster Hospital in Dundonald is named in his honour and the Major J.M Sinclair Memorial Pipe Band is further evidence of this esteem. 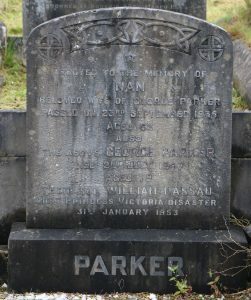 William Nassau Parker – ‘Willie’ was a fitter, like so many of the male fatalities, employed at Wig Bay aircraft factory. Married and living at Ava Gardens, his headstone at this scenic graveyard also commemorates his mother and father who had both predeceased him in 1935 and 1947 respectively. 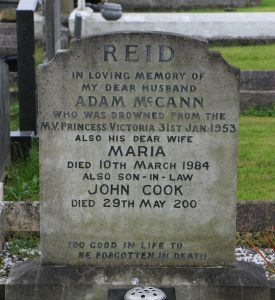 Adam McCann Reid – Married with a teenage daughter and living at Armitage Street in Belfast, Adam was another employee (a labourer) at the Shorts Brothers and Harland factory at Wig Bay. His body was recovered by MV Fredor in the early days of February 1953 and was brought ashore at Londonderry. Roseann Baxter – a 39-year-old stewardess from Larne, Roseann had been a Wren during World War Two, before working on the cross-channel service, initially with the Princess Margaret. Roseann was last seen on the ship’s deck, holding a baby in her arms. Adam Heggarty – a steward on the Princess Margaret, he died along with his Scottish fiancé Phillomena McDowall. The couple, aged 23 and 19 respectively, planned to marry 2 months later. 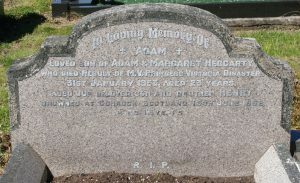 Adam’s headstone commemorates further premature loss with his brother also drowning in Gourock in 1962 aged only 13. 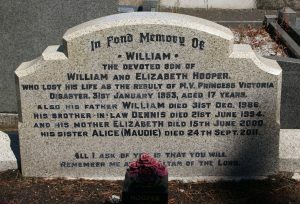 William Hooper – a 17-year-old pantry boy on the ship, William had always dreamt of going to sea, and 2 of his brothers had previously also served on the Princess Victoria. William was a second cousin of the other pantry boy on the ship William McAllister who, as mentioned in the introduction to this article, was the last survivor of the disaster to die. John Peoples – the ship’s mess room steward, ‘Jack’ was aged just 16 years and 10 months and was the youngest member of the crew when he perished. A keen cyclist Jack had recently purchased a new bike and would regularly take his new bike on to the ship with him. 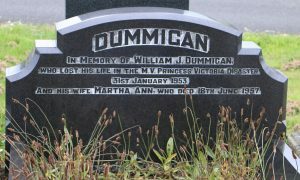 William Dummigan – A married 65-year-old greaser on the Princess Margaret, William was travelling on the Princess Victoria to commence his retirement. 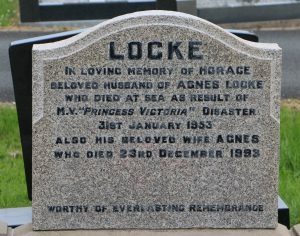 Horace Locke – a native of Scotland, Horace was not due to sail on the Princess Victoria’s fateful voyage, but had covered for a crewmate who was attending a wedding. 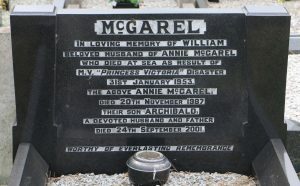 His wife Agnes was expecting their third child in Larne at the time of the disaster, dying more than 40 years after her husband. William McGarel – the 55-year-old quartermaster on the ship, William had fought at the Battle of the Somme, and lived in Larne with his wife and their 5 children. 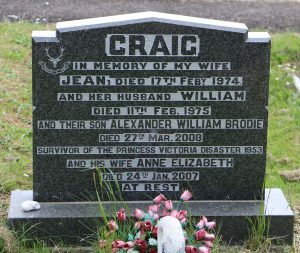 Alex Craig – Alex is recorded as a ‘survivor of the Princess Victoria disaster’ only passing away in 2008. When the sea breached the rear stern doors, able seaman Alex heroically had a rope tied around him and tried to close the door, but with no success. Alex was later thrown in to the water as the ship capsized, swimming to the safety of a nearby lifeboat (Number 6). From reading up about the disaster I can’t decide if anyone in particular was to blame for the sinking of the Princess Victoria, but I do know that there is so much heartache and heartbreak evident on these sad memorials, and in Stephen Cameron’s excellent book, perhaps reminding us of how precious and transient life is.